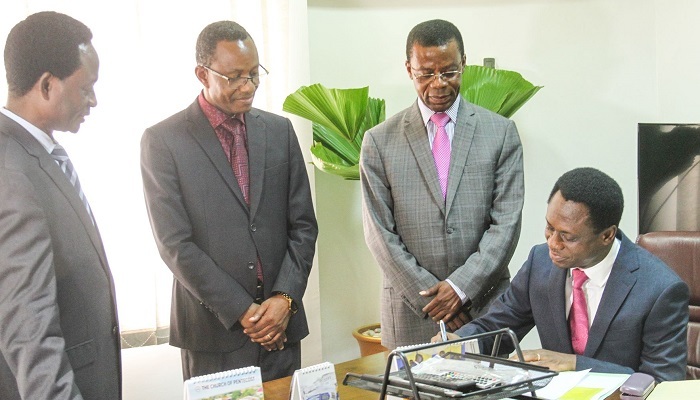 The Chairman of The Church of Pentecost (COP), Apostle Eric Nyamekye experienced his first day on the job on Tuesday, August 28, 2018 after a short handing-over ceremony was held at the Headquarters at La in Accra. The event, which was witnessed by the General Secretary, Apostle Alexander Nana Yaw Kumi-Larbi, and the International Missions Director, Apostle Emmanuel Gyesi-Addo, saw Apostle Eric Nyamekye formally taking over the administrative responsibilities of the Church from his predecessor, Apostle Professor Opoku Onyinah (retired). Apostle Prof. Opoku Onyinah presented to the new Chairman a signed copy of his hand-over notes as well as some personal documents which, according to him, would be very helpful to the new Chairman in discharging his duties. He then ceremonially put Apostle Eric Nyamekye in the Chairman’s seat to signify his assumption of office. Speaking at the ceremony, the outgone Chairman remarked that: “Ten years ago, I was officially welcomed into this office to begin official duties as Chairman of The Church of Pentecost. As soon as I began work I purposed in my heart to find a successor. It therefore gives me great pleasure to hand over to the new Chairman, Apostle Eric Nyamekye, to lead the Church. Apostle Nyamekye, in his response, thanked God for the great feat He has achieved for the Church and for counting him worthy to serve in the highest office of the Church. “I am grateful to God for what He has done for His church. I consider myself very privileged to be called to serve in this high office. Indeed, not everyone would have the opportunity to serve as Chairman of the Church. I have always said that I am probably not the best candidate for the office, there are others who are better than I am, but it is the Lord who has favoured me, so I am very grateful to Him. “I am also grateful to Apostle Professor Opoku Onyinah for the support and orientation he has given me especially since my election. He has clearly shown that he is very delighted about what the Lord has done, so I know that I can always count on his support and that of Apostle Dr. Michael K. Ntumy,” he said. Apostles Kumi-Larbi and Gyesi-Addo also expressed some of their fond memories about the outgone Chairman and expressed their eagerness to commence work with the new Chairman in order to advance the Kingdom business. As part of his first day in the office, the General Secretary together with Pastor Nicholas Darko (Finance and Administration Director), and Elder Nicholas Kumankoma (Chief Human Resource Manager), gave the Chairman a tour of the departments and offices at the Headquarters. The tour also took them to the premises of PENT TV, where the Chairman was met by children of Kodie District in the Suame Area of the Church, who were on an excursion to the Headquarters. Apostle Eric Nyamekye offered a word of prayer for them and joined them to take a group photograph to the delight of the children.